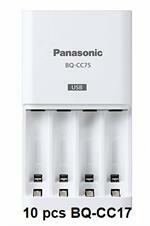 BQ-CC75 x 10 : Ten (10) Panasonic AA-AAA Smart Chargers. Net price $ 8.95 each. Smart Charger; plugs into Wall outlet; charges 1, 2, 3, or 4 batteries at a time. Has 4 separate charge channels - does each cell individually. Has auto-shut off. 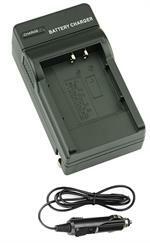 DVU-NIK1 : Smart Charger for Nikon style camera batteries. AC-DC worldwide operation. OUT OF STOCK. DVU-NIK1: Smart Charger for NIKON camera batteries. AC-DC WORLDWIDE operation; charge at home or on the go! Fully automatic; works with battery #s EN-EL1,EN-EL2,EN-EL3,EN-EL3e,EN-EL5,EN-EL7,EN-EL8,EN-EL9,EN-EL10,EN-EL11,EN-EL12 etc. KITCRV3: Smart Charger and rechargeable Li-ION CRV3 Battery. Replaces CR-V3, 2 x AA. The KITCRV3 includes a Smart charger, a rechargeable Li-ION CRV3 battery (DLCRV3), a Wall TX Power Supply, and a 12 volt DC Power Cord. 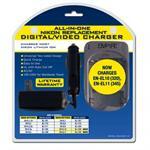 Ideal for Digital Cameras; the Li-ION battery can be re-charged hundreds of times! Replaces CR-V3 or 2 x AA cells. SOLO XP SPEED CHARGER KIT : Intelligent Fast charging kit for Li-ION Digital Camera & Camcorder batteries.